Our clients rely on us to do what’s best for them. Our long-term perspective has been developed serving the wealth management needs of families, business owners and organizations, with some relationships spanning over 30 years. Our focus is on finding solutions for each client’s unique needs. We believe that if we invest the time and energy required to explore our client’s goals and purpose, they can make a significant impact on the people and organizations of importance to them. 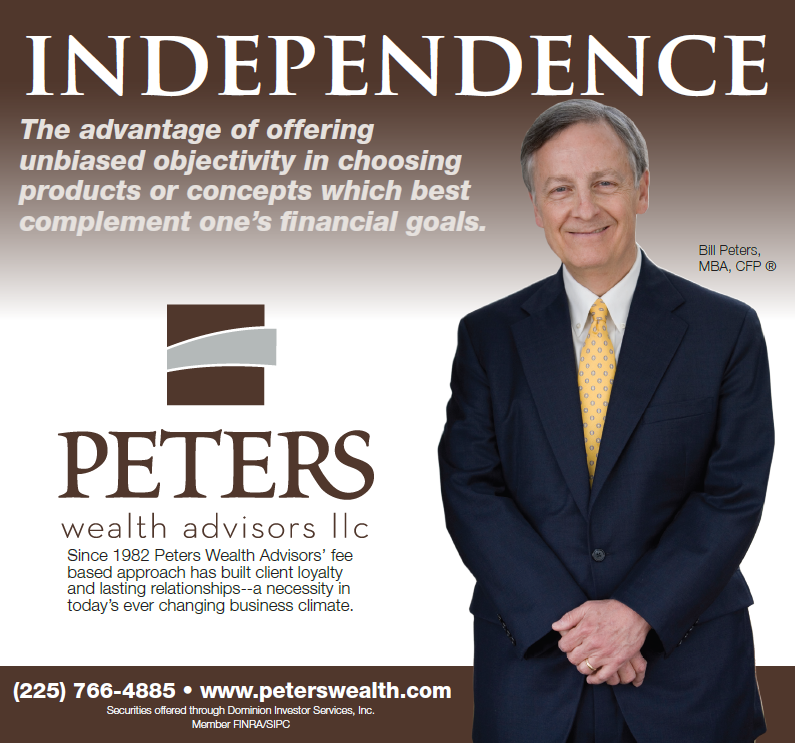 Founded in 1982 by Bill Peters, Peters Wealth Advisors, LLC is Baton Rouge’s oldest independent financial planning firm. Using a consultative approach, the firm has grown into a complete fee based wealth management firm, with over $200 million in assets under management. We are recognized throughout the community for objective investment expertise and financial planning advice. Our passionate and energetic team works with each client to assist in defining their financial goals. This is more than just fact finding. It is about developing a personal relationship with clients and assisting in achieving their investment objectives. This includes portfolios that reduce risk while maintaining desired spending requirements. Our personal and professional relationship with each client is one based on mutual respect, trust, resolve, and accountability to one another. Click the names below to learn more about our team. Click images below to learn more about the organizations we support. Past performance is not indicative of future returns. Future returns are not guaranteed & a loss of principal may occur. This information has not been audited and we make no representations as to its accuracy or completeness. The information found on this website is for general informational purposes only and is not intended as, and does not constitute, an offer to sell or a solicitation of an offer to buy any security, and should not be relied upon you in evaluating the merits of investing in any securities. All materials on the website including, without limitation, news articles, informational materials and all other manager-specific information, have been prepared for informational purposes only and do not constitute financial, legal, tax or any other advice. Prior to making any investment or hiring any investment manager you should consult with a professional financial adviser, legal and tax adviser to assist in due diligence as may be appropriate and determine the appropriateness of the risk associated with a particular investment. The information has not been approved or verified by the United States Securities and Exchange Commission, the United States Commodity Futures Trading Commission, the National Futures Association or by any state security authority. All copyright and other intellectual property found on this website, including without limitation all text, images, graphics and statements are the property of Almanack Investment Partners, LLC and any use of such materials in violation of the rights of Almanack Investment Partners, LLC is strictly prohibited. For additional information about Almanack Investment Partners, LLC, please visit www.adviserinfo.sec.gov. Investment Advisory products and services are being offered through Almanack Investment Partners, LLC a SEC registered investment advisor.